MagnaAmp | Innovatek Medical Inc.
MagnaAmp is a self-contained biological indicator ampoule for monitoring pressure steam sterilization of liquids in larger volumes. 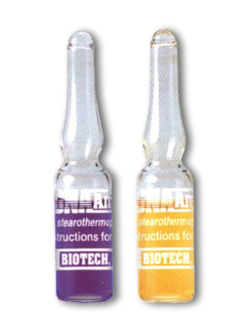 Each sealed glass ampoule contains bacterial spores in nutrient medium. Viable spore growth from a failed cycle will turn the broth bright yellow within 48 hours incubation at 57ºC. Ten negative control vials, containing only nutrient media and no spores, are included in each package. use with MagnaAmp 14-cavity incubator (now with calibrated digital thermometer). The unique neck allows the vial to be suspended mid-flask to ensure that conditions for complete sterilization have reached even the center of a body of liquid.